The difference between carpets and rugs is merely a matter of size, but the role that both have played in history can't be boiled down to semantics. Certain rugs and carpets have been held in high esteem as works of art, and around the world almost every culture has a special rug they believe is an example of superior craftsmanship. If you're reading this blog you've probably heard of Ardabil rugs, a special kind of rug that comes from the Ardabil Province of Iran. Rugs in this style could be considered the holy grail of carpeting since it takes years of practice and innate talent to properly make them. You may have heard of Ardabil style rugs, but have you heard about the two most famous Ardabil rugs of all time? The Victoria and Albert Museum in London and the Los Angeles County Museum of Art have the honor of displaying the most famous rugs in history. 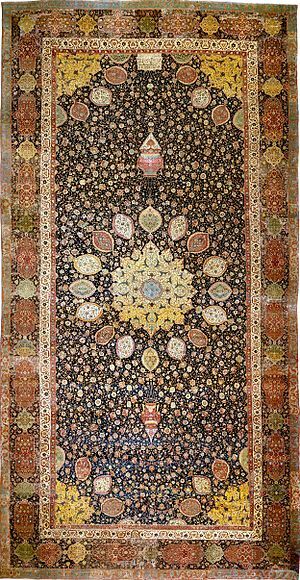 These rugs aren't your average three foot long throw rug, the Ardabil in the London museum is 34 ½ feet by 17 ½ feet. They each have a foundation of silk and wool pile with a knot density of 300-350 knots per square inch. The thing that sets these carpets apart from other Ardabils is the poetry that is weaved into the fabric. Each carpet has an inscription, a couplet taken from a ghazal (a poetic form that originated in the Middle East) written by Hafiz Shirazi, arguably the most well-known Persian poet of all time. 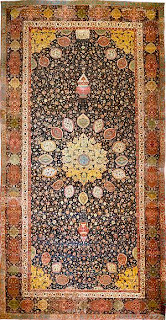 The carpets were completed sometime in the mid-16th century during the rule of the Safavid Shah Tahmasp, but they didn't reach their current locations until centuries later. One was sold to a British carpet marker in 1890 who restored it and then sold it to the Victoria and Albert Museum. The other was originally sold to an American businessman named Clarence Mackay, but Mackay wouldn't stay its owner for long. During an art exhibition in London in 1931 the rug was seen by the American industrialist J. Paul Getty who eventually purchased the rug for $70,000 several years later. Getty was contacted by agents who were sent on the behalf of King Farouk of Egypt who wanted to purchase it for more than triple the amount Getty paid because the king wanted it as a wedding present. Getty eventually opted to donate the carpet to the Museum of Science, History, and Art in Los Angeles' Exposition Park. When the Los Angeles County Museum of Art was established in 1961, one of the most famous rugs in history found a new home.